Ok now it's time to tell the tale of the early morning sea bass. Let me first begin with a few thoughts on work. This may seem like a topic ill-suited to a story on fishing, but really, this story is all about the work-play dichotomy. Now, I really like my job, as far as jobs go, but I just think that the whole 'division of labor' thing has evolved to a point where we are so far removed from our true roles as hunter-gatherers that our present lives are meaningless, monotonous, and dull. I think it would be more interesting if we still had to go out and catch our food everyday instead of having jobs at a plant that makes the plastic things that go on the end of shoelaces. At least that's the way it seems at 7:00 am when my alarm goes off. Maybe that's why I am so into kayak fishing, and being out on the water, or better yet, in the water. I feel like I am doing what I was put on earth to do. I feel alive and free and strong. I can get up to go fishing after only 3 hours of sleep and be totally jazzed as soon as I hear the alarm! Ironically, the best time to fish where I live in San Diego is usually when I have to work. It's just brutal. On my break times I look at the daily fish reports from kayakers that have returned from the water. I wish I was one of those mature people who wish well for others, but when it comes to fishing, if I'm not catching fish, I don't want anyone to catch fish. Conversely, if you're not catching fish, I don't need to, but if you are, and I am stuck at work, or even worse, I am paddling within earshot of you as you land a big one, that amounts to torture, it's not fair, and I resent it. Like I was saying, the best time to fish locally is when I am at work, and in particular, the elusive white sea bass that lurk next to the kelp beds in Southern California when the squid are running seem to hit right around report card time in the early spring- one of my busiest times at work. By this time in the year I have usually gained 20 pounds and I have that thousand yard stare that combat infantrymen and teachers seem to get. The concept of recreation, and really, of having fun in any fashion, seems like a distant memory, and I can't remember the last time when I got up the stairs without huffing. 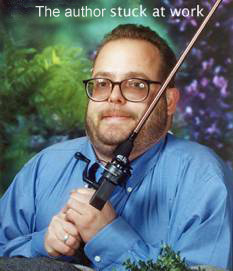 Still, I'll be fantasizing about fishing. I'll do stuff like promise myself not to look at the reports with pictures of the yakkers with the 50 pound beasts in their laps, but I always give in to temptation, and next thing you know I am hunched over at the computer, writhing in a fit of jealous misery. At some point I decided that enough was enough, that this madness had to end, that others landing gobs of huge fish could simply not stand. I drew my line in the sand. I decided that I would seize the moment by launching before and after school until I landed one. Wake up at 3:00 a.m., on the water at 4:30 in pitch black darkness, get off the water at 7:00, and at work at, uh, 8:15. Then go back and do it all over again after school until the sun went down. I would do this until my moment arrived, when I would walk back to school and into my second grade classroom with a giant fish in hand, basking in richly deserved adulation from my captive audience. I would then proclaim victory, post a "Ha-ha look what I caught" announcement on the websites masquerading as a fish report, and the existential angst that plagued my being would break up and spiral down the drain like a fur ball plied loose with a healthy dose of Drano-O. I actually did this for a week or so, all the while becoming familiar with the spot where most of the sea bass were being landed. Most of the fish that were being caught were in the 30-50 pound range, and I couldn't wait until it was my turn. 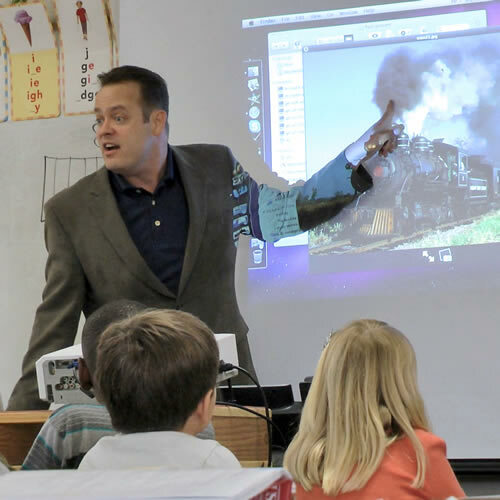 Thursday had arrived, and I still hadn't scored, so I decided that I would call in a half-day sub for my third grade class. This would give me more time; instead of having to get off the water at 7:00, I could stay out until 11:00. I launched before first light and paddled out next to the kelp, and turned on the fish finder. It's kind of neat being out there on the water in a kayak in the dark looking at an LCD screen! The juxtaposition of having a high tech gadget all lit up in your lap, while being in a tiny plastic kayak in the heaving seas in the dark, is kinda interesting. I metered some bait, and dropped down a sabiki rig, which is a long leader that has about 10 small hooks attached to it, several inches apart, and jigged the rig up and down. Within seconds my I was hooked up, and as the first rays of sunlight rose over the horizon, I reeled in a quick load of 8 inch greenback mackerel. Once I put the writhing baits in the live well in the back of my kayak, I paddled out to the spot, fly lined one bait out on the surface, and began to drop another one down with a 3 ounce olive sinker. Before this bait reached the proper depth, I felt a twitching in the line- the bait was nervous!- and then I felt the line start to pull, so I thumbed the spool, letting the fish eat. White sea bass can be very picky, slow eaters, and I knew that I had to let the fish feel like he could eat on his terms, not mine, so I let the fish run, until I couldn't wait any longer. I gradually applied pressure to the spool with my thumb, and then finally threw the lever drag into gear, and I was ON!!!!!!! I was so desperate to land this fish that I didn't even enjoy the fight- I was just hoping the whole time that I wouldn't lose it, and kept praying the entire time that things would work out- that my dry spell would be over, and that I could return back to my normal life. I had become so obsessed with this quest that I had become a zombie with only one goal in mind. I wasn't there for fun- I needed absolution and deliverance! The fish basically sulked at his depth and I put pressure on him so that he couldn't run into the kelp and strand himself. The thing about white sea bass is that for all their high status as a game fish, they actually don't put up much of a fight, pound for pound. A 15 pound yellowtail will fight with more gusto than a sea bass twice its' size. 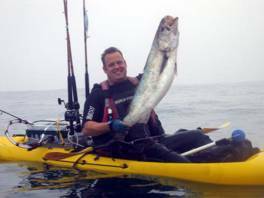 But since the sea bass are so much less frequently caught, and their meat is, in many people's opinion, the best there is, they are the ultimate prize for the San Diego kayak anglers- the "right kind". After about 5 minutes the fish came up. I gaffed him and threw him in my lap- thank you God! The drought was over! The curse had been lifted! 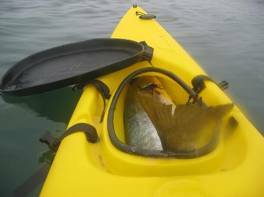 I screamed shouts of gratitude to the powers that be, plopped the beast in the forward hatch of my kayak, and began the short paddle back to shore. By this time it was only 6:45! I met my friend Jim on my way in and he offered to take some pics of me, and then it was back on shore by 7:00. It then occurred to me that I had called in a sub, and even I wasn't required to, I wanted to call school and make sure that a sub was planning to show up. Plus, I wanted to tell my friends at the front desk, Gail the nurse and Kathy the office clerk, that I was coming in in the pm with a big fish. It turned out that no one had filled the sub position, so I said, "You know what? I'll hightail it up Highway 5 and come in, I'm ready to teach!" I had plans to go to my favorite tackle shop and get an official weight, but time didn't permit this, so I quickly changed clothes at my house and showed up at work, just in time. You should have seen the look on the kids' faces on the playground when I showed up with the fish! There were like 200 kids on the playground, and I walked right up to my room with my fish on a stringer, and it was like a riot almost broke out. You have to understand that by this time the whole school knew that I was on a mission to score a fish, and many of the kids were either in my class or former students, so they were used to me being obsessed with fishing and understood the significance of this moment. Plus it's not often that a staff member walks around with a freshly caught fat sea bass! 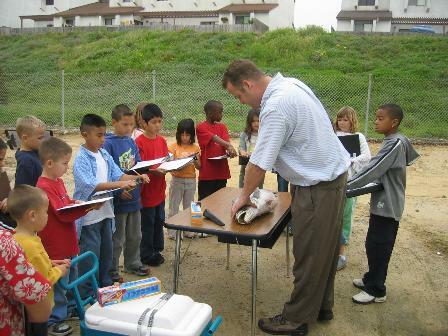 I had brought a cooler, and stuffed it in there, and set up the classroom for a day of hands on science and discovery. We had already done a lot of internet research in class on fish, so this dovetailed nicely with that. 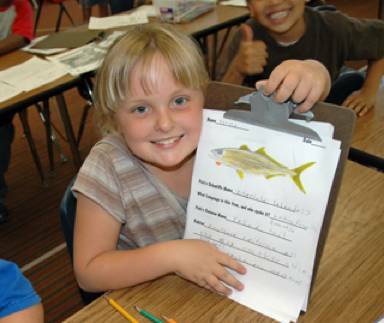 The kids wrote several papers that day, one where they had to write in the first person, pretending that they were the white sea bass who was caught ( 1st person narrative being a 3rd grade standard) and they also wrote a factual account of the entire day's proceedings called "Our Fishy Day", complete with drawings. Their writing was very inspired! Of course we also did a lot of hands on science with the fish, weighing it twice with two different scales, examining the stomach contents and various body parts, and so on. The day concluded with me giving some fillets to Mrs. Suggs, a class mom who had helped out by bringing some bags. One of the students, Gwen, was friendly with my own daughters, and we had already gone on fishing trips together on the weekends, so he came to class that day and had a great time as well. 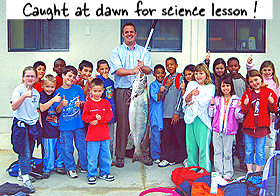 It has actually become a tradition now; every year, in the early fall or late spring, I try to catch at least one fish and bring it to school, and it is almost always at the top of the kids' list for the year's favorite activities!